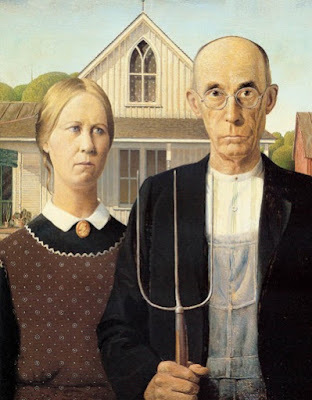 Grant Wood is best remembered for his classic painting, American Gothic. American Gothic is still hanging in the museum where it was unveiled in 1930, the Art Institute of Chicago. It won a $300 prize and went on to become one of the most readily identifiable artistic works in human history. 5t gets parodied endlessly and I think it does that is that the work itself is a parody but at the same time it's an homage. Grant Wood walked a line between honor and mockery in that painting and in a lot of his work and frankly, that they key to his longevity. That painting appeals to people who want to celebrate American provincialism and it appeals to people who are repulsed by it at the same time. What a feat Mr. Wood, good job. I am working on a presentation I'm giving at the Kitchen and Bath Industry Show next month and I've been given carte blanche to do whatever I want. Within reason of course, I'll be designing a kitchen and explaining the software I use as I do it. The show's in Chicago so I want to make it relate to Chicago in some way. I can have this kitchen be anything and I like it when my designs tell a story. The Art Institute of Chicago is around two miles north of McCormick Place, where KBIS is taking place, so why not start with the Art Institute's most famous painting? Grant Wood was also an interior designer, and his art was influenced profoundly by his studies of Jan Van Eyck and others, so I think he'd approve of me paying an homage to American Gothic in a modern kitchen. I can't just design out of thin air, I need a narrative. So I'm busily making one up. 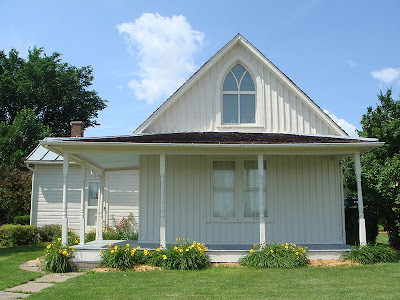 The house in the background of American Gothic is a real house in Eldon, Iowa. So if that's a real place, I need a believable story. I think I'll make up two guys who are die hard modernists. I see a non-sociopathic Don Draper and a Rodger Sterling, hold the narcissism. Don and Rodge are tired of the hassles of living in Chicago and decide to buy a place in the country. Hello Eldon, IA. So now I have clients and a house. I'm half way there. How could the interior of a house like that be reinterpreted through a Modernist lens? to be truthful, a lot of what's driving this story is the painting of course but shortly after I had that idea, I came across this faucet. 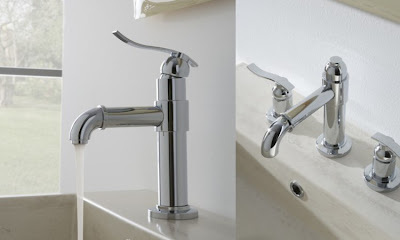 It's the Bali from Graff Faucets. 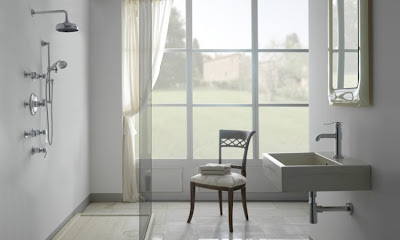 The Bali is a series of faucets that reinterpret a water pump. I'm telling you, it's the faucet that's going into the house in Eldon. Don and Rodge already approved it in fact. This is fun! But it's not helping me with this kitchen project. Mercifully, SketchUp's 3D Warehouse gives me access to all manner of modern lighting, furniture, plumbing, appliances and anything else I'll need. So now it becomes a matter of what kinds of things would go into this kitchen in Eldon? Is an apron front sink too easy? How about it I modern it up like this Kohler Verity? I'm pretty fond of Brizo's Venuto, so I think that's what'll go in the kitchen regardless of the sink. Since it's one of my designs, it'll have a big kitchen table in it. Probably the Bungalow by Thos. Moser. 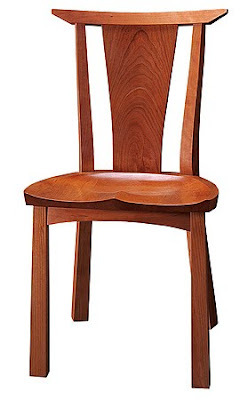 I like that table paired with Moser's Edo chair. Now comes the hard part though. What kind of appliances are they going to get? What's going on the counters? How do I use Ingo Maurer lighting effectively? What do you guys think? If you were to modern up the interior, specifically the kitchen, of Grant Wood's American Gothic house in Eldon Iowa, what would you use? Paul, I am seriously connecting to this post. My husband and I own a 100 head cow herd in Eldon, IA. (Yes, cows. He's from Iowa and was raised on a farm even though he is quite the corporate man now.) I went there with him the first time this past summer. Eldon is in the middle of the most beautiful farmland you've ever seen. We were driving along and I saw a sign for the American Gothic House. I yelled out to my husband that WE ARE GOING THERE! They have the nicest little visitors center complete with costumes in all sizes for men women and children, pitchforks and everything. The woman working in the visitors center walked out with us in front of the real American Gothic House and took our picture with us in full costume. Evidently, they do this for anyone that asks. My favorite parody is Miss Piggy and Kermit the Frog. To get to the point - I think you are definitely on the right track with your concept and selections. Enjoy Chicago! PS - I've finally given in and started my own blog thus my new comment name. Love your ideas! Look at Grant Wood's painting called, Dinner for Thrashers, and it will show you exactly what the kitchen would have looked like in the American Gothic house! Would be great fun to incorporate some of these home-spun things into a very modern interior...so American! Congrats on starting your blog, keep at it and let me know if there's anything I can do to help you. Thanks for your comment. The more I learned about the backstory of American Gothic the more sense this idea made. I never knew that the house in Eldon existed until a couple of days ago. What a thrill it must have been to stumble upon it. Based on my limited exposure to Iowa, I don't doubt that the countryside surrounding it is beautiful. There are some times when I really pine for a rural escape and I think that's the key to why Grant Wood's paintings appeal to me so much. Oh wow Judy, thank you! I'd never seen that painting before. Ha! I like this. Now, I am going to come straight out of the corner you would expect: concrete couintertops. And the reason is simple - it can become whatever you want and that is exactly the challenge at hand (and that's why I design with it, d-oh). So cool, Modernist look in a Carpenter Gothic shell. 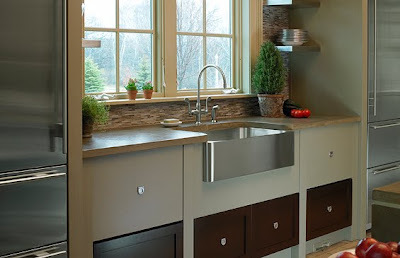 I like the undermount stainless farm sink. I would top this with a polished concrete top in a silver/fog gray, and integrate a cast-in drainboard (to make the farmhouse tie-in) with raised bars of stainless steel inset in the pitched plane. Find a place to arc the front edge of that (or another) top, a bit of Johhny Grey (making the modernist kitchen a bit unfitted) another subtle gesture toward "heritage", and a calculated move to bring in the curves of the Moser pieces. It's concrete - you can do whatever you want - you don't have to find it in a catalog! Thanks for your input Richard. Funny you should mention Johnny Grey. I spent some time with him at a conference a couple of weeks ago and as a direct result of a dinner time conversation with him about unfitted-ness, I've been playing around with furniture legs on islands with free-form tops. Concrete's the perfect medium to expand my repertoire beyond Carerra. I have noticed your predilection for Carerra and others of that ilk! Actually, it's not that funny I should mention Johnny Grey; as you mentioned he has been on the radar a lot lately and I have been an admirer for awhile - I think his approach to kitchen design has a lot of crossover between very clean modern (in materials and juxtapostion) and very basic human-scale (in function and individualism) - he is not a cut-and-paste designer - and neither is the concrete medium, by definition. There are pictures of an English Gothic kitchen in Johnny Grey's book "The Art of Kitchen Design". But maybe that is too much influence on an original design? One farmhouss element you could build upon is the 'Hoosier' cabinet, a free-standing furniture-like piece usually in Oak with an enamelled pullout worktop. Richard and Chuck, have you two ever met? I think you guys might have a thing or two in common. Richard is @concretedetail on Twitter and Chuck is @chuckwheelock. But back tot he business at hand. Richard: I am rethinking my whole idea now that I'm thinking in terms of free-form concrete counters. mom2reese: I love lurkers and any friend of Rachele's is more than welcome to weigh in. I love the idea of the tractor stools. It's funny you should mention the Karbon by Kohler because I've been milling that one around too. Have you ever been up close and personal with one? Maybe keeping the scale of that one but using the materials you mentioned above? I love those old sinks. Perfect! I hope you make it to Chicago too. I have my booth assignment and presentation schedule and I'll post it later. It would really great if you were there. Daily! I ordered a Karbon in the summer of '08, and I'm still happy with my decision today. 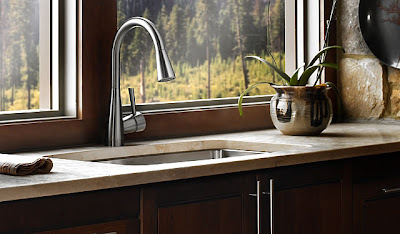 I love the faucet - the look is perfect for my kitchen and overall, it's great functionally. I don't miss having a separate sprayer at all, and I like the fact that I can fill pots, vases, pitchers, etc. on the countertop and "fix" the faucet into whatever position I need. On the vanity side, we get many compliments/comments on the faucet from guests. With the good there's some bad: while it moves easily, it's not effortless/ballet-like as the Kohler videos would have you think. Also, I'm often turning the joystick with a wet hand, so inevitably, water drips down on the escutcheon. While it wipes off easily, water spots are quite noticeable because it's such a shiny and large escutcheon. Thanks for the welcome - cannot wait to see the finished story! A little bird showed me photos of your kitchen last night. It's stunning, absolutely stunning. That island deserves and award.